A foolish knight is certain that his side of the wall is the safe side in this meta picture book. There's a wall in the middle of the book, and our hero--a young knight--is sure that the wall protects his side of the book from the dangers of the other side--like an angry tiger and giant rhino, and worst of all, an ogre who would gobble him up in a second! But our knight doe A foolish knight is certain that his side of the wall is the safe side in this meta picture book. To ask other readers questions about The Wall in the Middle of the Book, please sign up. It's a metaphor. About morons and their damn walls. This book is so good. If you ever want to read a children's book that is political but without giving too much away, then read this one. It's pretty much trashing Donald Trump's wall and I love it! In THE WALL IN THE MIDDLE OF THE BOOK, a young knight, who has been taught to fear what is on the other side of the wall-in-the-middle-of-the-book, is in for a good surprise when bad things happen on his side of the wall. “There’s a wall in the middle of the book. from the other side of the book. This side of the book is safe. While the young knight climbs a ladder and speaks fearfully of the ogre on the other side of the wall, his supposedly-safe side of the wall steadily fills with water and a crocodile appears. Meanwhile, on the other side, we can see the ogre who might appear scary to some but, literally, won’t hurt a mouse. As things get truly desperate on the knight’s side, the ogre reaches over the top of the wall, plucks the knight from the rising water, and brings him to safety. I’m on the other side of the book! “Haw-haw-haw! I’m actually a nice ogre. The knight realizes the truth about the other side of the book, and this leads to a joyful scene that recalls Max and the wild things having a wild rumpus. THE WALL IN THE MIDDLE OF THE BOOK promotes openness and letting down fears of “other.” It will counteract the prejudices that young children are deliberately or inadvertently taught by adults and by other young people. There are plenty of adults who could benefit from a storytime presentation of this book! This book really surprised me. I have read many, many Jon Agee books over the years. The Wall in the Middle of the Book, in my opinion, stands out from the pack with power and truth for all ages. Watch, read, or listen to the news and then read this book. It says it all in a simple, straight forward way. Absolutely BRILLIANT!!! Great use of book design - the gutter of the book defines the wall with the action taking place either side. Great pace and contrasting dramatic and comic possibilities. Watercolour illustrations and style reminiscent of Maurice Sendak. A funny, kid-friendly little story full of what’s-going-to-happen-nexts. Ah! I thought I was kind of over the meta picture books, but this one does a really good job with the "book as object" approach. The gutter contains a brick wall, and the little knight who narrates is on the "right" side. Or is he?? Lots of humorous details will clue in alert readers and may spark a discussion about judging what we don't know. For another book that uses the gutter to great effect, try "This book just ate my dog." Such a great book with a very necessary underlining message. Excellent. Brilliant messages are delivered in a well written and charmingly illustrated way. Love the subplot. Good for preschoolers to adult. More #kidlit commentary on our political climate. We let assumptions blind us and divide us. Super cute book showcasing two stories going on at once — one on each side of the book. At first, the narrator (who looks to be a young boy in armor), is so happy to be protected on the left side of the book. On the right side are scary wild animals and a dangerous ogre. But before too long, the narrator is trapped on the left side of the book and he needs rescuing. How oh how will he survive?! I love this one — it’s always fun for young readers to discover a big secret even before the narrator Super cute book showcasing two stories going on at once — one on each side of the book. At first, the narrator (who looks to be a young boy in armor), is so happy to be protected on the left side of the book. On the right side are scary wild animals and a dangerous ogre. But before too long, the narrator is trapped on the left side of the book and he needs rescuing. How oh how will he survive?! I love this one — it’s always fun for young readers to discover a big secret even before the narrator does. Plus, the artwork is ADORABLE! First sentence: There's a wall in the middle of the book. And it's a good thing. The wall protects this side of the book...from the other side of the book. This side of the book is safe. The other side is not. Premise/plot: A knight is convinced that his side of the wall is safe...but is it really? Could the knights have his facts wrong? My thoughts: I really enjoyed this one. It is a quirky--but fun--read. Adults may enjoy this one just as much--if not more--than children. I loved seeing the acti First sentence: There's a wall in the middle of the book. And it's a good thing. The wall protects this side of the book...from the other side of the book. This side of the book is safe. The other side is not. This review has been hidden because it contains spoilers. To view it, click here. 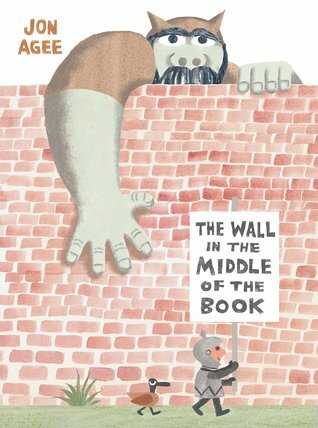 This is a children’s picture book about a man on one side of the wall who thinks that everything is great on his side and that there is a scary ogre on the other side of the wall. Meanwhile, the waters are rising on his side of the wall and there are scary sea creatures and it is the ogre who saves him in the end! Walls to divide people and things are just never a good idea. Jon Agee does a great job with simple text and simple illustrations with a strong message. I think kids will enjoy shouting out the “dangers” that are happening on the left side of the wall. Simple and sweet. Inspired the continuing "grass is greener" conversation. Would be fun for storytime. I loved this book! Jon Agee is spot on! Okay, I have to admit it. I was at the NCTE (National Council of Teachers of English) conference, and my friend was standing in line to get this book and have it signed by the author-illustrator Jon Agee, and I was meeting her. As I stood there keeping her company, I thought “Why not? This is a picture book. It’s free. I have grandsons and work at a K-8 school, and Mr. Agee looks pleasant” and—yes, technically, I cut in line—I got a signed book. What a find! The Wall in the Middle of the Book is Okay, I have to admit it. I was at the NCTE (National Council of Teachers of English) conference, and my friend was standing in line to get this book and have it signed by the author-illustrator Jon Agee, and I was meeting her. As I stood there keeping her company, I thought “Why not? This is a picture book. It’s free. I have grandsons and work at a K-8 school, and Mr. Agee looks pleasant” and—yes, technically, I cut in line—I got a signed book. What a find! The Wall in the Middle of the Book is simply written to verbally and visually portray a powerful message about what walls keep out and which side of a wall is actually the “safe” side and who is actually “dangerous.” Who—or what—is a perceived ogre, and are all ogres dangerous just because they are ogres? In the lower grades, this story sends a great message about stereotypes; in the upper grades it can serve as an introduction to discussions about walls and borders and even The Wall. Clever, funny, meta without being obnoxious. I know Trump doesn’t read, but hopefully he can manage this picture book about a Wall. I think he could learn a lot from it. A very big hit with my first graders. Loud guffaws and shrieks, “Look at what’s happening on YOUR side of the wall!” Indeed. This book isn't just about the absurdity of building a wall for "border security." It's about propaganda. It's about the kind of ignorance that right wing propaganda propagates. And it's about the dangers of arrogantly making enemies of neighboring communities, because it may just be that at some point we need their help. And it might just be that making friends is a much better strategy for survival than making enemies. Fear can lead us to shutting ourselves out of some amazing experiences as the knight in this book learns first hand. Just because you've heard a certain thing or a person looks a certain way, you cannot make assumptions. What a great lesson, and I truly loved how it was implemented! A clever, amusing work of metafiction. A muted, yet clear, lesson on what we think safety is and what it actually might be. A wall separates a book--one side has a small knight, the other side has an ogre. The knight thinks the ogre will eat him. As water rises behind him, the knight revels in his safety. Halfway through the book, he's caught up in the water--whereupon the ogre rescues him, reaching over the wall, and then showing him the other side of the wall. Is the book a social lesson or just one on perception? Either way, it wo A muted, yet clear, lesson on what we think safety is and what it actually might be. A wall separates a book--one side has a small knight, the other side has an ogre. The knight thinks the ogre will eat him. As water rises behind him, the knight revels in his safety. Halfway through the book, he's caught up in the water--whereupon the ogre rescues him, reaching over the wall, and then showing him the other side of the wall. Is the book a social lesson or just one on perception? Either way, it works. CNBC: "The Trump administration wants to build a 30-foot-high border wall that looks good from the north side and is difficult to climb or cut through, according to a government website detailing President Donald Trump's promise to build a "big, beautiful wall" at the Mexican border. Trump says the wall is necessary to stop the flow of immigrants crossing the border illegally and drug smugglers." I picked this up because my wife likes to read the occasional picture book. The title caught my eye because of the resemblance to The Monster at the End of this Book. And having cracked it open, I was intrigued by the novel use of the book's gutter as an actual divider between the left and right sides of the book. The overall story was very predictable, culminating in a pleasing conclusion, but the actual events on either side of the wall leading to that end (animal stacking, rising water) just l I picked this up because my wife likes to read the occasional picture book. The title caught my eye because of the resemblance to The Monster at the End of this Book. And having cracked it open, I was intrigued by the novel use of the book's gutter as an actual divider between the left and right sides of the book. Creative usage of the format with the wall existing in the gutter of the pages; beyond the visual lies an effective allegory of our country today...i.e., silly knight fears the unknown on the other side of the wall...tries to convince the reader that he's safer on that side of the wall...sound familiar? Hey. Know any ridiculous people who think building a wall protects and divides the good from the bad? Maybe send them a copy of this brilliance. I’m taking donations to send to a certain person in a certain white house. Maybe I’ll send my 6-year old to read it to him. The wall in the middle of the book protects the people on one side from the animals and monsters on the other side of the book. Why I started this book: Another recommendation. Why I finished it: I love books that subvert/foil your expectations. And to do that in less than 40 pages with minimal words is amazing. My early drawings were very animated: a lot of stuff zipping around, airplanes, racing cars, football players. No surprise my first published drawing was a pack of rats running along a highway (The Rat Race). I did that for the New York Times Op Ed page when I was still in I grew up in Nyack, New York, just up the street from the Hudson River. In our house, there was always an art project going on. When I graduated, I hauled my pile of doodles into the offices of a bunch of editors, with the wild notion that somebody might publish them. When that failed, I wrote a story for kids to go with my pictures (IF SNOW FALLS). It was two sentences long (which counts, by the way). Frances Foster, a wonderful editor at Random House, saw something in that book and signed me up. The next book, ELLSWORTH, was about a dog who teaches economics at a university. When he gets home, he throws off his clothes and acts like a dog, which is fine, until some fellow teachers discover this and he loses his job. Somebody told me that ELLSWORTH was a story about "being yourself." I never realized it had a moral. I moved to another publisher with LUDLOW LAUGHS, the story of a grumpy guy who laughs in his sleep. This book was doing very poorly until the comedienne Phyliss Diller read it on PBS's Reading Rainbow. It stayed in print for over twenty years. My fourth book, THE INCREDIBLE PAINTING OF FELIX CLOUSSEAU, was a hit. One of the first people to see it and give it the thumb's up — literally, hot off the press — was Maurice Sendak. We bumped into each other at the printers. It was a lucky first meeting, and happily not our last. That was all a long time ago. Since then I've written many other picture books, illustrated a few by other authors, and created a series of offbeat wordplay books, beginning with the book of palindromes, GO HANG A SALAMI! I'M A LASAGNA HOG!